At The Scuba Doctor we get to see plenty of dive lights. Our current favourite diving torch for both recreational/sport and technical diving is the Dive Perfect Stubby LED-1000 Dive Light. Indeed we all liked it so much, each of us added one of these diving torches to our personal dive kit immediately! Dynamite Comes In Small Packages — Packing a bright punch of 1000 lumens, this little light rivals some of the big boys with respect to sheer illuminating power. Whether hunting for rock lobster (crayfish) and abalone, exploring dark spaces inside sunken wrecks, enjoying a night dive, or delving into the cavern zone deep within caves, the Dive Perfect Stubby LED-1000 Dive Light will surely light the way for an amazing dive adventure! The Dive Perfect Stubby LED-1000 features a 10 degree centre spot beam angle with 60 degree spread. The centre spot beam is perfect for signalling a dive buddy, or illuminating a cray hole, passage, or underwater critter during the day! The 60 degree spread lights up the world at night and in cave or wreck environments. The best of both world's! Powered by three (3) AA size batteries in a triangle battery pack, the Stubby LED-1000 needs no external charger (unless you decide to use rechargeable batteries). With a solid and robust construction of aircraft grade aluminium, you might scratch it but you won't break it! With the triple O-ring design, the chances of flooding the Stubby LED-1000 are almost non existent. Use this bad boy with the included Soft Goodman Glove and you have a hands free lighting solution that will even make the technical divers on your adventure envious! With it's centre back attach point, you can even clip this off to a D-Ring or retractor to ensure you don't lose this bright light. Need to use the Dive Perfect Stubby LED-1000 above the water? Go ahead! With the built in overload protection circuitry, you can even use this on the surface, and the light will automatically dim to help prevent damage to the LED. 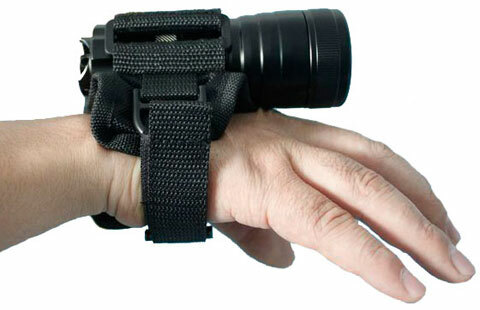 Taking hand-held dive lights to a new level! The Dive Perfect Stubby provides 800–1000 lumens of light, which is very bright. This thing cranks out the light power! Keep It Simple — How often are we told to keep our dive gear simple. Well this is the approach of the Dive Perfect Stubby. Simple twist on, twist off control. Designed to work in the harshest conditions and take all kinds of abuse. Extremely Compact — This compact, powerful and comfortable handheld LED dive light represents excellent value and is ideal for clipping off, or having in the pocket as a backup dive light for technical diving. Sport/recreational divers can also use this small rugged dive light as a primary torch. This powerful dive light is so compact it fits perfectly on a CD/DVD disc! The scale of the main picture makes it look bigger, but it fits tip to tip right on top of a regular CD/DVD. It's a small package but it plays real big! Primary or Backup? — We found the technical dive masters at Bikini Atoll using this dive light as their PRIMARY torch for deep wreck penetration. They think it's that good! Great Burn Times — The Dive Perfect Stubby LED-1000 is powered by just three (3) AA size batteries in a triangle battery pack that is protected by a triple O-ring design to ensure you don't flood it. Depending on the quality of the batteries used, the dive light typically has a 1 hour burn time at maximum brightness (1000 lumens) and a run time of 4 hours of usable light (850 lumens). Our cave diving customers have been more than happy using the Stubby LED-1000 on difficult dives with 3 hour run times. Overload Protection: — This dive light also has built in overload circuitry, so you can even use it on the surface. The light will automatically dim to help prevent damage to the LED. Massive Performance, Great Value — The single CREE XM-L U2 LED bulb delivers a massive 1000 lumens of bright white 6000–7000K light and 3 to 6 hours of burn time depending on the batteries used. This is more than bright enough to provide light for any underwater requirement, especially as a backup dive torch. The Dive Perfect Stubby LED-1000 dive torch is an awesome, bright, hand held, compact, non-canister LED dive light and represents excellent value. Easy to Use — The easy 'twist on' and 'twist off' switch works well. The triple O-ring seal ensures a depth rating of 150 metres. Rugged, Durable and Built to Last — Milled, durable, aircraft grade, T-6061-T6 aluminium alloy is used to create an anti-corrosive anodized housing. Indeed, the Dive Perfect Stubby LED-1000 is milled with a durable, thick body. Safety Loop and Ring — The body design includes an excellent centre hard tie point at the base to attach a bolt snap (e.g. a Small or Medium stainless steel bolt snap with swivel-eye) so you can clip it off to a D-ring for easy mounting onto your BCD, or the shoulder straps of your BackPlate and Wing. You might decide to use a retractor with it. Or you can use the included Wrist Lanyard, the included Soft Goodman handle, or easily stow this compact dive light in a BCD pocket. Whatever option you choose, the Dive Perfect Stubby light stays with you. — performs better with higher end batteries (lithium polymer or rechargeable). Burn tests done with Alkaline batteries. FREE Soft Goodman Handle — When the Dive Perfect Stubby LED-1000 is used with the included soft neoprene Goodman glove you have a hands free light that even the experience technical diver will cherish. FREE Dive Perfect Soft Goodman Handle! Use as a Primary Diving Light: Of course you could use rechargeable cells in this dive torch with an appropriate battery charger. However, if you're using rechargeable batteries when the torch is being used as a recreational/sport night diving primary light, we recommend taking a good backup dive torch that doesn't use rechargeable batteries. Use as a Backup Diving Light: We think the Dive Perfect Stubby LED-1000 is an ideal robust backup dive light when use with non-rechargeable batteries. A backup light should never be loaded with rechargeable batteries because they are not as reliable and have an unpredictable discharge curve. Please turn on the dive light before a dive, and then back it off a bit to turn it off. This makes sure the twist-on, twist-off setup is in the correct position. Please clean the flashlight with fresh water after each dive. Please lubricate the switch threads and O-rings with silicone grease regularly. Please take out the batteries if you do not plan to use the dive torch for a long time. For more information about how to care for and maintain dive lights, please see Dive Light Care. Available exclusively from The Scuba Doctor. Please Note: We were originally told that the output of this dive light was 1500 lumens and promoted it as such. We've since learnt that the light output actually ranges from 800–1000 lumens of light depending on the battery charge. That's still incredibly bright and way more powerful than anything else we've seen on the market at comparable prices.